The ATS PAR will host its 13thannual Meet-the-Experts patient-family forum during ATS 2019. The event gives patients the opportunity to learn from and speak with leading physicians, researchers, and community organizers about specific lung disease topics. 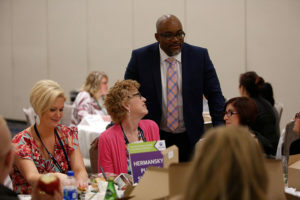 This year’s event will focus on “Taking Charge of Your Lung Health,” and will take place 10 a.m. to 2 p.m. Saturday, May 18, in Reunion Ballrooms A-F, Lobby Level, of the Hyatt Regency Dallas. From 10 a.m. until noon, a panelist of experts will speak on topics including pulmonary rehabilitation, oxygen therapy, clinical trials and shared decision-making. Panelists include Anne-Marie Russell, PhD, MScN; Daniel Croft, MD, MPH; Narelle Cox, PhD; Kathleen Lindell, PhD, RN; and Kelly Chin, MD. Complimentary parking, lunch, and oxygen will be provided. Patients wanting to reserve space at the PAR forum should RSVP by email to Courtney White at cwhite@thoracic.org by May 8. For questions, contact Mr. White at 212-315-8640.